An important way to keep your cat healthy. 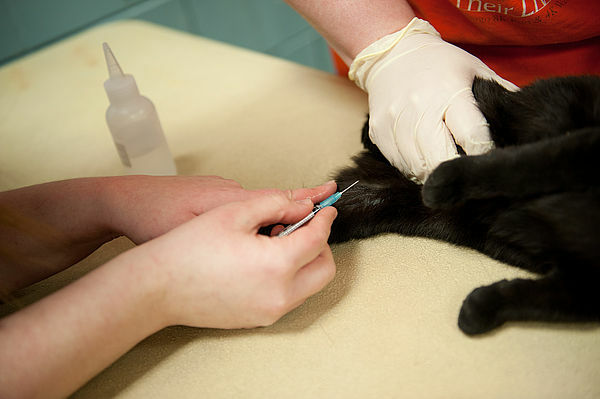 Vaccines protect your cat from specific viral and bacterial infections. The 3-in-1 vaccine protects cats from panleukopenia (cat distemper), feline calicivirus, and rhinotracheitis. Kittens should be minimally vaccinated at 8 weeks and 12 to 16 weeks. Unvaccinated cats older than 4 months need to be vaccinated two times within a three- to four-week period to build up their immunity. After that, blood tests to check immunity (vaccine titers) are recommended every two to three years. The rabies vaccine protects your cat from contracting rabies. It can be given at 12 to 24 weeks of age. The first follow-up rabies vaccine is given one year later. After the first vaccine, it can be given as a one-year or three-year vaccine. In 1991, vets began noticing a higher than expected number of sarcomas occurring on cats' bodies where annual vaccines are commonly injected. There are theories that overvaccinating animals that are already immune (from previous vaccines) may contribute to these growths. It persists for more than three months after the vaccination. It is larger than two centimeters in diameter. It is increasing in size one month after the vaccine. Be sure your vet is rotating the location of the vaccines and choosing distal locations on legs or tail. Ask for a blood test (titer test) to check the level of immunity prior to vaccinating (except for rabies, as vaccination is required by state law). Many vaccines last for many years. When possible, choose vaccines that have longer duration, such as using three-year versus one-year vaccines where possible. This will decrease the number of vaccines in a cat's lifetime. Talk to your vet about the vaccines they purchase and the manufacturer's safety record. Talk to your vet about what vaccines your cat should get based on your cat’s lifestyle and environment.